Makin' it in Memphis: Exterior: Porch Plans. Now that our bushes are replaced, I have been thinking about phase 2 of exterior renovation - replacing our wrought iron with wooden posts. I once likened our wrought iron of our house to braces on a teenage girl. I truly despise our wrought iron. When I drive up to our house, while I love our house and am grateful for it, I cringe upon seeing the wrought iron. Yes. That extreme. Seeing as our house was built in 1947, the wrought iron fits it. But, seeing as our neighborhood is more of a 1920's neighborhood, the wrought iron sticks out. But I have plans. I have been craving white wooden posts (I learned from my architecture-student brother that they are NOT columns, as I had called them - he was very offended) and have done some research as to what I would like. I want square posts, not too thin or chunky, and I want a larger square at the bottom and top (like the bottom right picture) to create interest. I really like the posts best in the small picture of the house in the top middle right but it is a really small file and gets pixelated - not helpful. What I'm trying to decide is whether to do white railing (like the majority of the pictures) or a black metal railing like the top right picture. Thoughts? ok it obviously depends on what feel you are going for but i vote no railing. 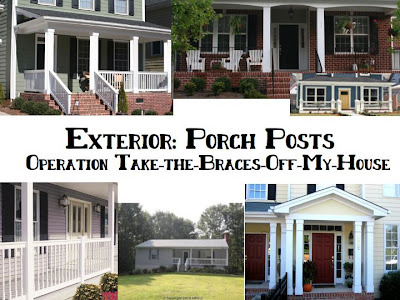 i love open porches and you can do plants on the floor to create a bit more privacy or frame the porch more. and it is cheaper... but if you want a closed in porch, i vote white railings :) anything would be cute i'm sure!